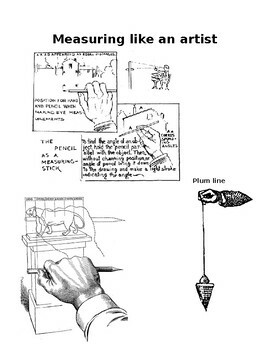 Using a pencil to set an angle. Using a pencil and your thumb to measure how many "heads" long the subject matter is. Great supplementary handout for students with longer processing. Perfect compliment to a lesson on drawing proportions. Techniques are most appropriate for ages 13+, but can be fun in drawing lessons starting at 4th grade.